Within the past two years, a concerted media campaign has been launched to promote the ‘spider-goat’, a goat genetically engineered to produce spider silk proteins in its milk. Many of us were caught by surprise, because transgenic animals and the associated somatic cell nuclear transfer cloning began in the late 1990s  (Why Clone At All?, ISIS report), and have been practically abandoned a decade later on account of the low success rates on top of the unacceptably high rates of death and abnormalities, and suffering inflicted on both cloned animals and surrogate mothers (see  Unacceptable Death Rates End Cloning Trials in New Zealand, SiS 50). The current public relations campaign started in May 2010 with a report and video presentation from the US National Science Foundation’s in-house magazine, Science Nation . Seven cute little goat kids were on show. Three of them were transgenic for the spider silk gene, we were told, and the rest not; the clear message being that there were no discernible differences between spider-goats and normal goats. A year and a half later, the spider goat is hyped as a marvel of the new ‘synthetic biology’ beyond genetic engineering . Another video sequence features a somewhat dazed BBC reporter invited to an ordinary farm to meet “absolutely regular” friendly spider-goats, again indistinguishable from ordinary goats, to dispel any negative image one might have of “frankenstein” animals . At around the same time, Dutch artist Jalila Essaidi, along with Forensic Genomics Consortium Netherlands, was given an award of €25 000 for her idea to create bullet-proof human skin – one-up on the spider-silk bulletproof vest – by incorporating the spider-silk into human skin in culture, or maybe to genetically engineer humans to produce the spider silk protein in the skin [6-8]? A third video sequence shows how human skin grown in culture at Leiden University Medical Centre and impregnated with spider silk from spider-goats and worms produced at the University of Utah in the United States stopped a specially slowed- down bullet, though not one shot at normal speed. An exhibition was mounted at the National Museum of Natural History in Leiden, the Netherlands. Why was such a revolting idea worth pursuing? In her press release, Essaidi said : “I want to explore the social, political, ethical and cultural issues surrounding safety.” By safety, I think she meant the safety of humans being shot at. “The project leads to aesthetically very impressing and fascinating results.” She concluded. Spider silk is indeed a marvel, and the spider-goat is surely a worthy instrument for bringing it to us, is it not? I tried to locate the scientific paper describing the creation of the transgenic goat, but drew a complete blank. Science Nation put me in touch with the scientist who did the work, Randolph Lewis at the University of Wyoming, Laramie. Lewis wrote in an e-mail message : “The best information on the goats themselves is the patent by Nexia Biotechnologies and they never published a paper from that patent.” But the patent , I soon discovered, was on producing the silk polypeptide and contained nothing on the creation of the transgenic goats. Actually, the spider-goat was headline news almost 10 years ago. Nexia was the Canadian biotech company trying to sell spider silk from the transgenic goats. But the venture failed because the spider silk was way below the quality of natural silk , and the company went out of business. So, the spider goats seen on video were all bred from the couple of cloned goats, and were all hemizygous, which at least avoided the deaths, abnormalities and suffering involved. However, the ethical issue remains. It is hardly acceptable to exploit animals in this way, particularly as more successful and acceptable alternatives already exist (see later). It is worse than breeding animals for their fur, as the female’s milk will not be available or suitable for nurturing the young. Also, the biosafety dimension cannot be swept under the carpet. Transgenic animals not only carry the stated foreign genes (in the case of the transgenic goats, the spider silk genes), the genes are delivered in vectors that often contain other sequences from viruses and bacteria including antibiotic resistance genes, which often remain in the transgenic animals, but we do not know what these are. There is no report in the scientific literature or anywhere else that reports the characterization of the transgenic sequences in the spider-goats’ genome. Lewis is clearly aware of other ways of producing spider silk, as he informs me in another e-mail: “We currently are producing the spider silk protein in E. coli, the goats and in silkworms. We are pursuing all three as production systems with specific applications targeted for each system as they each have advantages and disadvantages.” But he did not elaborate what the advantages and disadvantages were. Almost nothing of what Lewis told me about the spider-goats is in the scientific literature or any other publicly available reports. I did e-mail Science Nation via their website, copied to the National Science Foundation – which funds the spider-goat project – asking if promoting unpublished, non-peer-reviewed science was their policy, but have so far received no reply. Surplus goats for our dinner table? In that paper, Lewis and colleagues examined blood from 5 nontransgenic dams that carried transgenic offspring using PCR sensitive enough to detect the presence of spider silk transgene at 1 to 100 000 dilution (approximately 90 cells per millilitre of blood), and could not detect any signal. Similarly, transfers between transgenic and non-trangenic foetuses were undetectable. Further, they found no ectopic (out of place) expression of spider silk genes in the heart, lung, liver and brain. Nevertheless, they admit that the findings do not rule out ectopic expression of the spider silk gene in other untested tissues and fluids or the transfer of DNA and cells between foetus and mother or between foetuses. And more studies with a larger sample must be carried out. What the paper did reveal was the intention to pass surplus animals into the food chain, which is neither ethical nor safe ( Cloned Meat and Milk Coming, SiS 50). Not least because we still do not know what foreign sequences are in the transgenic animals apart from the spider silk gene in general terms. All the transgenic sequences, including the spider gene, are potentially harmful, especially if they end up in the genome of our cells. Horizontal transfer of transgenic DNA is the most underestimated hazard of genetic engineering, but it can indeed happen ( Scientists Discover New Route for GM-gene ‘Escape’, SiS 50). 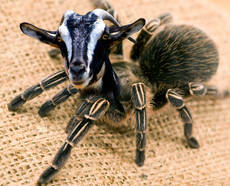 Moreover, the spider-goats may look indistinguishable from normal goats, but that does not mean they are the same biochemically and physiologically. The transgenic goats have never been characterized at any level, nor have they been risk assessed for the production of a transgenic herd. The legality of the transgenic herd itself is surely in question. A fully referenced version of this report is posted on ISIS members website and is otherwise available for download here. This entry was posted in Biotechnology, Environment, Genetically Engineered Food and tagged genetic contamination, gmo food, horizontal gene transfer, silk milk, spider goat, transgencis. Bookmark the permalink. Your excellent article leaves me rather speech less. I don’t think people are still sleeping by now… now, i think it is willful ignorance, intellectual dishonesty and cowardice. The media betrayal is beyond the pale. This evil society won’t last much longer! The excuse is a lie. These monsters fear that their results of cruel and evil work will get out and they will be stopped and harmed for their violence. “Lewis and colleagues are clearly aware of the biosafety issue. In a paper published online in October 2011 , they remarked that regulations for the disposal of genetically engineered animals are strict due to concern for their inappropriate introduction into the food chain.” Sometimes I think it best that man dies off like the dinasours before him to allow the planet to recover and allow animals to redeem order. Sometimes I think it best that man dies off like the dinasours before him to allow the planet to recover and allow animals to redeem order. Your statement makes it sound as if humanity is the cause of the troubles today… for the weird science and pollution and war. I detect a bit of the old “blame the victim” mentality there. Tsk tsk tsk. Humanity has been controlled for countless hundreds of years. Freemasonry, secret societies and a self appointed elite have caused this damage… we haven’t allowed it, we haven’t been able to stop it. When we collectively realize there are fates worse than death… when we will no longer stand for the lies and destruction, when we want a moral and decent world more than life itself, we’ll make it. Clearly, we’re not there yet. Don’t condemn your fellow man, that just keeps the psychopaths in business. I have often thought the same way, but what a tragedy for the domesticated species who would not be able to survive without human care. Wanda, this reply of your’s comes across like smokescreening and a false man argument to me. What has our nasiness to our own got to do with planet recovery except perhaps to bolster the argument? Tie in those exploiters in the 2 still “separate” camps a vbit more so people see the connect. Some desparately do Not want to see it. They think every attack on a “capitalist” or an entrepeneur is a blow againsst free markets. Well, many don’t really remember all Mr Adam Smith said in preface. They jump directly to the Greed is good and Ayn Rand supermanisms that are tricking the moral folk who are not very leftist inclined. Well… i contend that social engineering is the reason for the lack of morality that leads to the break up of families, loss of morality and me-first attitudes. That comes from the psychopaths… it all stems from the way society has been guided. If you have a moral society, morality reigns. All we have now is a few scattered individuals that try to hold the fort and an entire society pitted against them. They’ve corrupted our schools, our media, our military and police, every form of institution and even our medical and food systems… they did it… the so-called elite. I believe humanity is basically good. If they weren’t, why have to go through so much trouble to lull them to sleep? Wow…I had no idea. Thank you for researching and sharing. this site is incredible. thank you..